The Trump administration will use a central argument from legal challengers of U.S. EPA's Clean Power Plan to rescind the Obama-era climate standards. 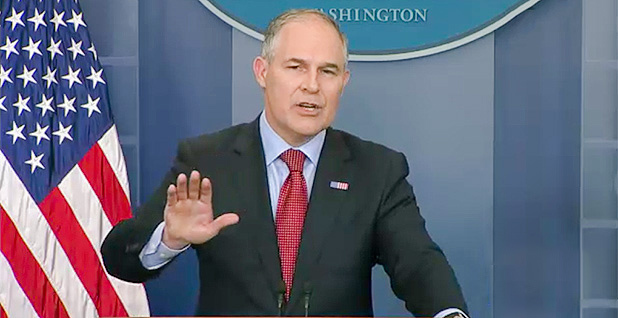 EPA chief Scott Pruitt will argue that the agency went too far in setting carbon reduction goals by looking at what the broader power system could achieve instead of focusing solely on improvements at coal plants, an administration official told E&E News. Obama's EPA contended that it made sense to accelerate a market trend away from coal and toward lower-carbon natural gas and renewable power. Critics said the agency exceeded its authority by trying to regulate the entire sector. States and industry groups brought that challenge, along with a slate of others, in September to the U.S. Court of Appeals for the District of Columbia Circuit. Pruitt was among them as Oklahoma's attorney general. The decision to focus on the legal argument is expected. But it also signals that EPA might not, as of now, try to fight the science behind the rule. Environmental advocates say they will contest the reversal of the Clean Power Plan once Trump's EPA makes it final. The agency recently sent a draft to the White House Office of Management and Budget for review (Greenwire, June 9). "We'll wait and see what actually emerges," said Sean Donahue, a lawyer representing a coalition of environmental groups in the litigation. "I'm sure that the many organizations and states that supported the Clean Power Plan and that support climate action would challenge any rescission on whatever ground." Donahue said he would not be surprised if EPA relied on a legal rationale, "because it takes a lot less work than a factual one." An industry lawyer said that even if the agency thinks the regulation is illegal for several reasons, officials only need to use the strongest one to revoke the Clean Power Plan. The rulemaking to rescind the Clean Power Plan is far shorter than the regulation itself, which was hundreds of pages. It comes with a regulatory impact analysis that will consider the societal benefits of reducing carbon in the United States, but not the rest of the world, according to the source. That assessment will also count the benefits of energy efficiency differently. Those changes would greatly increase the projected cost of the regulation and could be meant to strengthen political arguments that it would do economic harm. The Clean Power Plan was core to America's international pledges to curb climate change under the Paris Agreement, which Trump has said he will exit. Court battles about the regulation could drag out for years, potentially determining how future administrations act on climate. After OMB finishes with the rulemaking, EPA will publish the draft and take comments. Then the agency will issue a final version, which is when environmental groups and green states are preparing to sue. They also will challenge the federal government if EPA rescinds the Clean Power Plan and then never replaces it with alternative standards. They say EPA's prior finding that carbon is a danger to public health requires it to regulate sources of emissions. Climate advocates could bring an "unreasonable delay" case, although there is not a specific deadline for EPA to take action on greenhouse gas emissions. The Trump administration could also decide to fight the endangerment finding, which would be a huge undertaking. 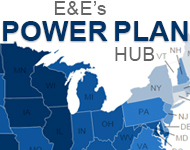 The Clean Power Plan is currently on hold, following a stay from the Supreme Court. The D.C. Circuit has agreed to halt its consideration of legal challenges until at least the end of June while the Trump administration decides how to handle the regulation. The court could issue a decision or give EPA more time to finalize its proposal. EPA spokespeople did not respond to requests for comment.